the nytpicker: Do Most Of NYT's Science Staff Doubt The Dangers of Global Warming? That's What One Prominent Science Journalist Claims. So journalists are actually skeptical? I thought skepticism was at the core of all journalism. Why should global warming be any different? I would rather have a skeptical journalist who probes with the right penetrating questions than an evangelist who pretends to be a journalist. I get enough of that on the BBC, thank you very much. Oh, and I am not in the least skeptical about the dangers of AGW. I just expect journalists and scientists to be skeptical for me. That is how it should be. P.S., Now, I'm actually worried about the NYT's science staff who have no doubts about global warming. Anonymous is correct. Global warming is hard enough for the researchers to understand and that makes it even harder for the journalists to write about. Then the poor journalists get it from either side because nothing is conclusive. The Al Gore acolytes accuse the journalists of being on the payroll of big oil and the everything-is-fine ostriches complain when the journalists give the story any ink. I've seen plenty of good, old fashioned skepticism from John Tierney and Andrew Revkin. But I've also seen a willingness to ask the right questions. Revkin covered the decline of the polar ice caps, the biggest proof to me of global warming. Shoot. I think he actually flew up there back when newspapers had a travel budget. There is no answer to this one yet and so we can't know whether the coverage is good or bad yet. Thanks heavens the times reporters aren't scientists. "Any comment on Alessandra Stanley's double whammy errors: http://www.nytimes.com/2010/03/12/arts/television/1"
Is this the story on "Tiny Specs of Earth"? What happened? Looks like the NYT pulled the story. The link to the Stanley article has been fixed. This is a technical problem The Times has recently been having with many articles. The Stanley link was broken last Friday and fixed at that time. It seems to be working at the moment, but it may break again before I can hit SEND. I wish I could confirm that this was a great conspiracy and coverup. It would make for a much better story. EXCLUSIVE! NYT Plots and Schemes to Cover Up 2 of Its 4,000 Yearly Errors! 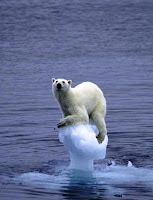 decline of the polar ice caps, the biggest proof to me of global warming. So it doesn't bother you, even just a little, that the polar ice largely disappeared ~100 years ago, perhaps even to a greater extent than now? Just flushed down the memory hole with that, eh? Crying wolf by suggesting there's shadow cyber voodoo stick going on rather than assume responsibility and terminate cyber-leakers only adds to typical american mccarthite paranoia. Poor polar bear. Well, it's not fair, and it's not about believing in the scientific consensus. Tierney for example has been a vocal advocate of foreign investment in Iraq, so even mention of the environment, or ethical concerns compicates that interest. It's the idea that a merchant class can be expanded, provided the ground conditions are safe, and being bothered by ecological degradation, and so forth is just too much science and not enough business, ok? So, get in step and adjust, there is no Toyota conspiracy. To out someone for private conversations they had off the record is bad for morale, especially if it's an image-altering bit about a very popular colleague. too much "nit" and too little "picking"